Thanks to years of experience, we have developed an even easier and more fun formula! In a large pot bring 4 liters of water to a boil. Mix straw pellets with beet ones. Pour the pellets into the pot and bring it to a boil for 2-3 minutes. Pour in equal parts the substrate obtained in the two bags supplied with the kit. Allow the substrate to cool down to 30 °C. Subdivide the "Funghi Mara" mycelium contained in the bag in the two bags of substrate after reading "The development of Mycelium" and "Cultivating mushrooms". Fold the top of the bags (without sealing) and stop the folds with the clips supplied with the kit. Keep the substrate package at 25-30°C. In about 30 days a white mold will develop: it is the mycelium of the fungus that indicates that the substratum is incubated and ready to be cultivated! Wait until the substrate is completely white. Using the nebulizer included in the kit (with which you will recycle a bottle of water) keep the substratum moist with light and frequent wetting. Keep the substrate package at 15-25°C, protected from sun and wind. Mushrooms will begin to be born in 2-3 weeks. To guarantee the highest quality, these operations must be carried out in strict hygienic respect: clean environment, colander and hands carefully washed with soap or denatured alcohol. After pouring the mixture or substrate into the bags, open the bag of mycelium with clean scissors and, without touching it with your hands, pour it into the bags in equal parts. With one hand grasp the upper and empty part of the bag, lift it up and with the other hand (which of course must also remain out of the bag to avoid contaminating the mixture) begin to manipulate it and work it to evenly distribute the mycelium poured out. Make a bag of rounded shape like that of the design where, after having pushed with the index finger inside first one then the other of the two plastic corners of the bag, you will have created a stable base of support. Spread the "cushion" compound, always from the outside of the bag, as shown in the photos above. In both cases the upper part of the edge of the bag will be empty and folded on itself and stopped with the clip of the kit, as shown in the pictures and in the drawing. The roundish shape is the most classic sack shape reminiscent of those of the first growers; the "cushion" type has a larger cultivation surface but requires a lot of attention when wetting so as not to dry the mixture. The beginning of incubation is visible already in the first week: the small points of mycelium, at the beginning almost invisible, begin to swell presenting itself as a micro white swab. From here, in the following days start thin cell strands, the fungal hyphae, which intertwine with those coming from other points of inoculation covering, over time, all the compound of a white patina: at this point the substrate is completely incubated and invaded from the mycelium and is ready to be grown and produce mushrooms. From the day of sowing to incubation the mixture should be kept at an optimum temperature of 25-28 ° C.
When the substrate, or compound, is white and incubated it is time to start cultivation! Small surface portions of substrate not completely incubated outside do not affect production. The production can take place both outdoors (corners of the garden or terrace provided they are well sheltered from the wind and the sun) and in closed rooms (dwelling, cellar, garage, warehouse, barn) free of drafts, with light of twilight but never reachable by the direct rays of the sun. 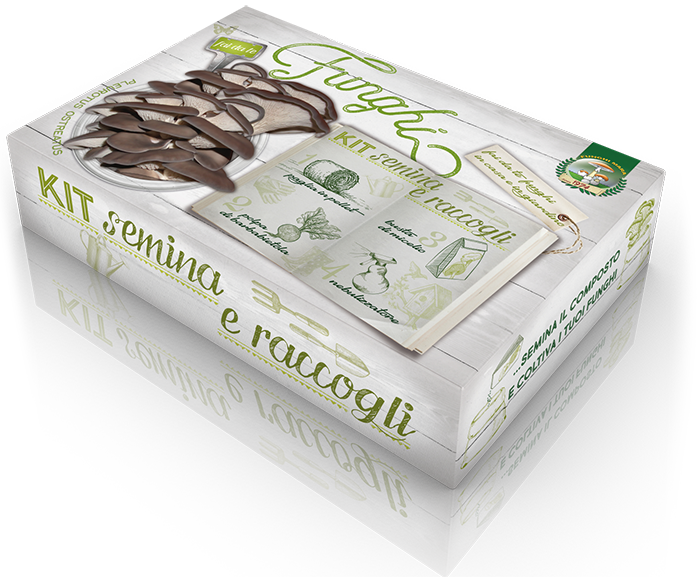 To start the crop it is sufficient to make some small cuts (3-4 cm long) on ​​the plastic of the bags and the mushrooms will start to come out and come out. 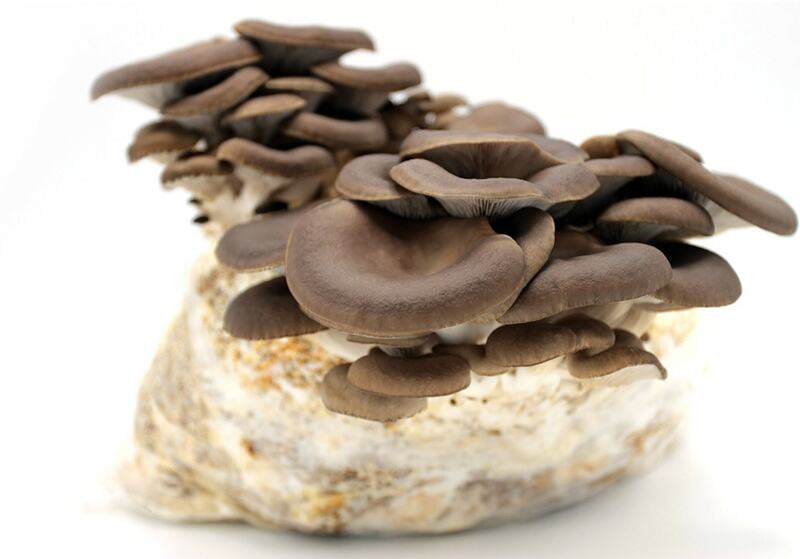 If the plastic is adherent to the substrate, the exit of the mushrooms will be easier; if it is not, the mushrooms will be born under the plastic and it will be advisable to help them out by practicing other small cuts. Wet the cuts first and then the mushrooms with the nebulizer: use a saucer if you do not want to wet the floor. When the mushroom reaches maturity, remove it manually even if you remove a bit of straw: do not cut it because the stem residues recall midges and molds! Altogether you can have from 3 to 5 grows. With the used compound, mixed with 3 times of earth, you can have an excellent soil for your flowers and your nursery. Each tablet will give about 2-4 sprints but the total production will be concentrated in a shorter time! Reading the above you could consider how easy the cultivation is, provided that you follow the guidelines given that, even if apparently simple and obvious, are the result of long years of rational scientific research, experimentation and study and not of empiricism and of improvisation. When something goes wrong, the reasons must be found for not repeating the same mistakes. As soon as the small mushrooms die, they dry and then rot. Mushrooms should be grown in the shelter of wind and air currents especially at the time of birth (germination) because they are very delicate and die easily. If the dead mushrooms are then left on the mixture and wet, rotting attracting mold and midges: in this case it is advisable to gently clean the mixture removing the dead mushrooms then, patiently, wait for a new birth keeping the mixture moist and soft but not too much wet. Mushrooms already a few centimeters, suddenly rot and then die. Surely you have wet them too much and at one time. This often happens when you forget to wet the bag, then suddenly you notice that there are mushrooms and then ... we go from one extreme to another: lots of water. Clean up the bag and start again! Mushrooms make a long, stringy stem with a small head. Lack of light: we talked about light of twilight but not of lack of light! 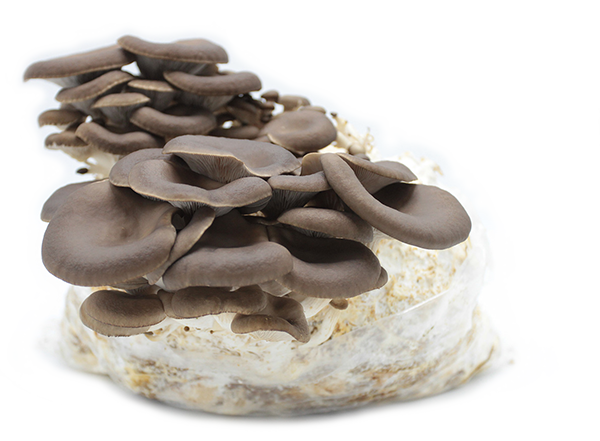 Remember that we are cultivating Pleurotus and not Prataiolo where light is not needed. It is winter, there is light of twilight but the mushrooms have long stem and small head. In the culture room or it is a little too hot or lacking air. During the hottest hours of the day put your sack outside on the terrace or on the sill: the mushrooms will become darker and take on another aspect.